Vogue Ginny - A Pretty Little Red Haired Girl! 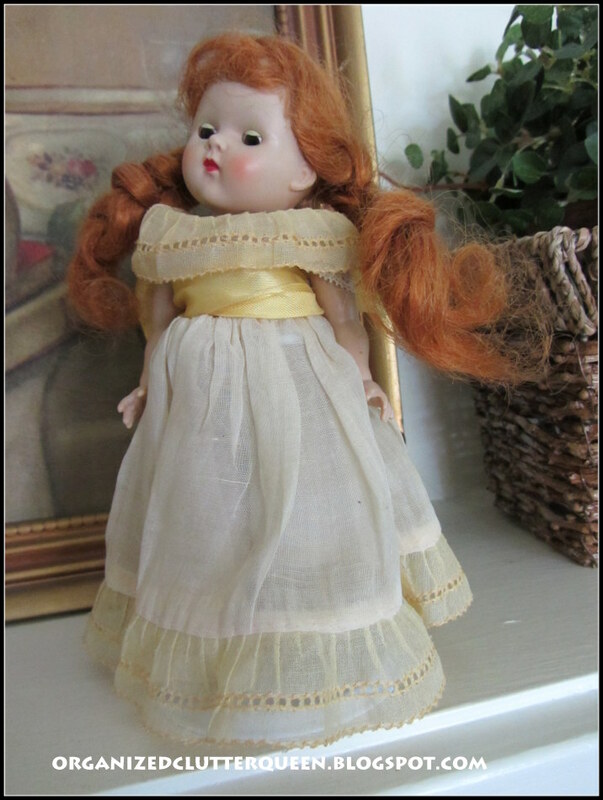 I don't collect dolls, but I have several vintage dolls from the 1950's and early 1960's that were my toys as a child. This Vogue Ginny doll came to me second hand. My Grandma used to clean and babysit for a banker's family in a small town in northern Minnesota. The banker's daughter was a little older than me, and my Grandma received a few of her hand-me-down dolls for me. She is just a beautiful little doll with red braids, rosy cheeks, hand painted eyes, a button nose and a little rosebud mouth. 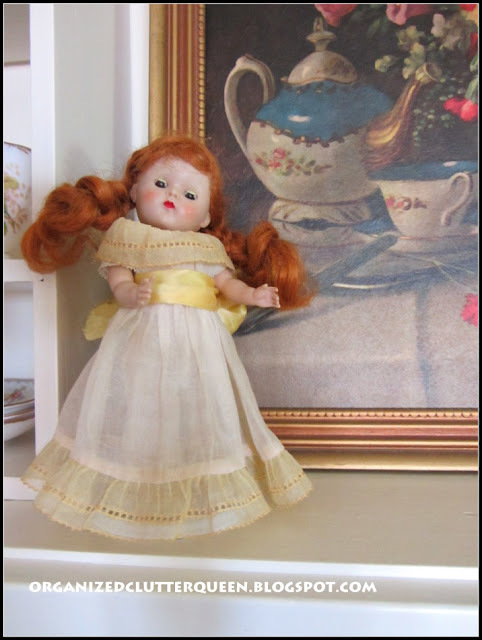 I found a website, Kaylee's Korner of Collectible Dolls that has a brief history of the Vogue Ginny doll, here. Did you have a Vogue Ginny? Love your Ginny doll and I really love the picture that she's standing in front of. I don't collect dolls either, but I've picked up a few here and there because they were just too cute to leave behind! Your red headed Ginny is adorable! 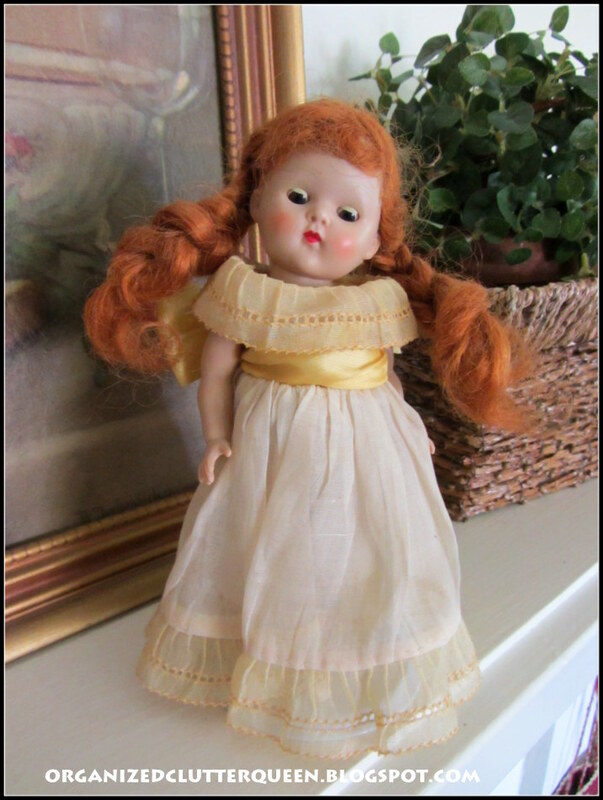 What a darling little red haired doll you have! What a sweet little story too. How marvelous you've kept her all these years. Those dolls are so sweet and much more meaningful being that they were yours. Ginny is very special! I wasn't much of a doll person as a kid, but I did have one doll with no clothes and another hand me down cloth doll with yarn hair. Anyway, this Ginny doll seems to have some real personality! My best friend's mom had a huge doll collection behind glass at their house. I bet she probably had one of these. She seemed to have everything! It was fun to get a close up look at yours. 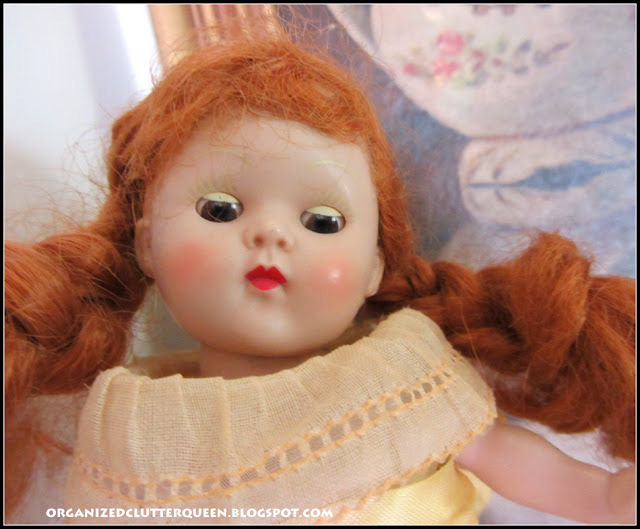 I loved Ginny dolls--but had to love them in a toy store! I do have one hand-me-down without it's original dress or box, so I'm not sure which one she was. I love your red-haired beauty! Carlene, your Vogue Ginny is a beautiful doll. Her red braids are so charming -- the yellow-trimmed dress is the perfect outfit to show off her hair. I did not have a Ginny doll. How fortunate your grandmother had an eye for beauty and brought this treasure to you. Ginny was my best friend when I was a young girl. Wespent so many hours together and she had a huge wardrobe. I don't know what happened to her but I do miss her. I never had a doll. You have some very pretty ones that are definitely treasures. Hang on to them. These are so adorable. So glad you have them. LOVE your Ginny! I have a brown haired Ginny from my childhood. So fun! And I LOVE the teapot picture on your wall! Thanks for your sweet comments, and I will love to check in when I get blogging again! Hello! It's nice to meet and follow you! You have such nice dolls, they are so cute! Your Ginny reminds me of a girl named Anne Shirley, a character in Anne of Green Gables! So pretty! Hope you'll come and have a peek at my blog! Ginny is so cute and almost aloof in her expression and her dress is so dolly chic. Your vintage Ginny's eyes are so sweet! I still have my Ginny dolls from the 70s...I only have three. They aren't as vintage and cute as yours! Your Ginny doll is so precious, specially her sweet little face. I can see you took good care of her all these years. Your dolls are wonderful. I do collect dolls and have a room full of them but most of mine are new dolls. I have bought a few that remind me of those from my childhood though and they are favorites. I don't have a Ginny doll but I love them! 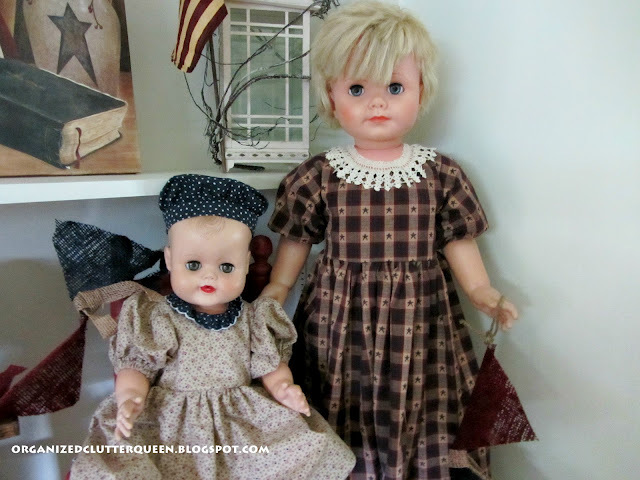 I never had a Ginny but she makes me fondly remember my Betsy McCall dolls. She is a beauty. I don't have a Ginny but I have a few of my dolls from my childhood. I need to post about them. They are really getting old now, hah. I do have a Ginny doll and a Madame Alexander Wendy doll that both came to me as an adult. Love them both. Yours is especially sweet! Carlene, Ginny is so sweet! I loved dolls when I was young. Sadly I have none of my childhood dolls. I think most of them were passed down to my neice. Love your other dolls as well. Thanks for sharing them with Share Your Cup. 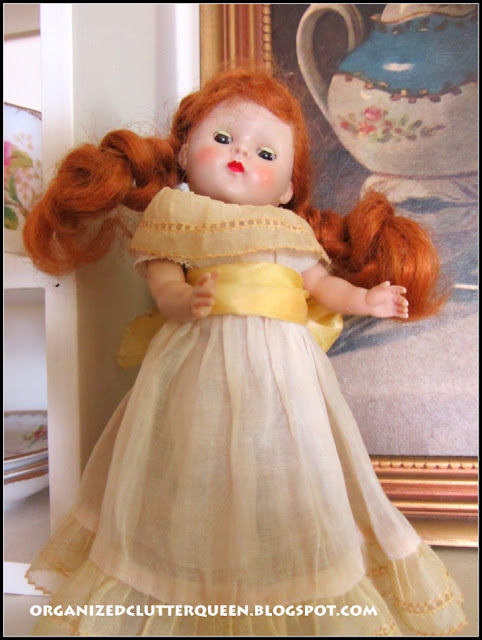 such a sweet little "Ginny" doll! Her sweet dress and red hair are simply wonderful! Hi Carlene! I love the story behind your Miss Jenny doll! She is something special. Thank you for joining TTF and have a great day! My daughter is starting a doll collection of her own. Problem is, I bought so many accessories for her first doll, such as dresses, shoes, and hats. Since it’s her birthday at the end of the month, I’m going to buy her another doll. Saying out loud when I’m around, “It would be much ‘fun-ner’ if Lulu has someone to share all her shoes with,” is an obvious hint. Did I mention she’s only 4 years old?